Birthplace somewhere near London, England, U.K. Distinctive features Captain Defender has very handsome features and an athletic build. His hair and cape are always moving as if caught in a breeze. The repulsive Dexter Kyle was given megapowers by the alien D'Phndri after he helped free the being from a mystical snare set at Stonehenge by Mysteria. The D'Phndri gave him great strength and reflexes, an energy staff, and a handsome outer appearance to match his noble heart (for the full story, read the Captain Defender trade paperback). Kyle became Captain Defender, a deputized officer of Scotland Yard, until he later moved to New York City. Personality Captain Defender believes in the law, and is determined to thwart all criminal activity. He is unable to tell a lie, and doesn't engage in any form of dishonorable conduct. He acts in a chivalric manner, and won't even physically strike a criminal woman. He is protective of all innocents, but has a special place in his heart for orphans. His inner nobility may make him see things in terms of black and white, but he always does the right thing. 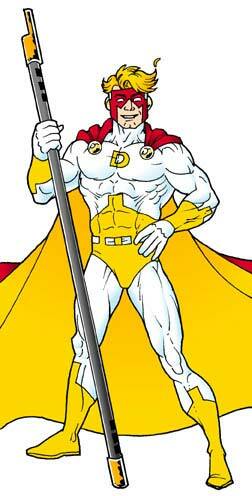 Captain Defender is at the peak of human perfection. He can lift nearly two tons and has phenomenal reflexes and speed. Once per day, he can channel all his strength into a powerful punch he calls the Lawmaker. It is powerful enough to puncture nearly 2" of solid steel. This punch has a debilitating effect on him, and he needs time to recover from the drain to his strength afterwards. He is resilient to all types of physical and energy attacks, taking 25% less damage than he normally would. His body is physically perfect, making weak points very difficult to find for others with the skill to do so. His costume never stays torn or dirty. He can summon a breeze to waft through his hair and cape while summoning a beam of light to shine down on him from the heavens. All of this increases his presence in the eyes of villains, usually resulting in them surrendering or fleeing. His staff can fire bolts of energy or stretch in length to 20 feet so he can pole vault with it. It also has a flag in the head which he can unfurl at will. He can deflect all ranged attacks with the staff. Skills He is skilled in acrobatics and breakfall, as well as hand-to-hand combat.